Two weeks ago, we told you that the world leaders at the G7 Summit had a big opportunity to recognize the importance of quality education for all children and youth, especially those affected by conflicts and crises, with a focus on girls. All children deserve the chance to reach their full potential, and the right to a quality education is a huge part of that. So, did the G7 deliver? YES! Thanks to World Vision leadership (especially by WV Canada) and coordinated advocacy efforts by organizations around the globe, the G7 countries adopted a Declaration focused on the importance of investing in children’s education in crises — with a special focus on girls, who face additional barriers to education, particularly in situations of conflict or disaster. Alongside this Declaration, these world leaders also made a global commitment of CAD $3.8 billion (US $ 3 billion) to support girls’ education programs. This significant level of funds is a tangible sign of the intent of the Declaration: to ensure that millions of girls who are out-of-school because of conflicts or disaster are not left behind. While the U.S. did not contribute to that financial commitment, the Declaration had full support from the USAID Administrator. The Declaration and the large financial investment will serve as a catalyst, to provide children — especially girls living in the world’s most disaster-prone or conflict-affected places — with the tools they need to unlock their talents and power. By best estimates, this initiative will impact 8.67 million children living in crises situations around the world. In places like Syria, where civil war has been raging for over seven years, or Uganda, where millions of refugee girls have been out of school for more than nine years, this commitment to education will bring hope to and empower these girls. The world leaders did their part — but we’re also grateful for you, advocates who told their elected officials that girls’ education should be one of their major priorities. Your voice made a difference! Want to do more? Join World Vision Advocacy today and speak up for children living in the world’s most difficult places. 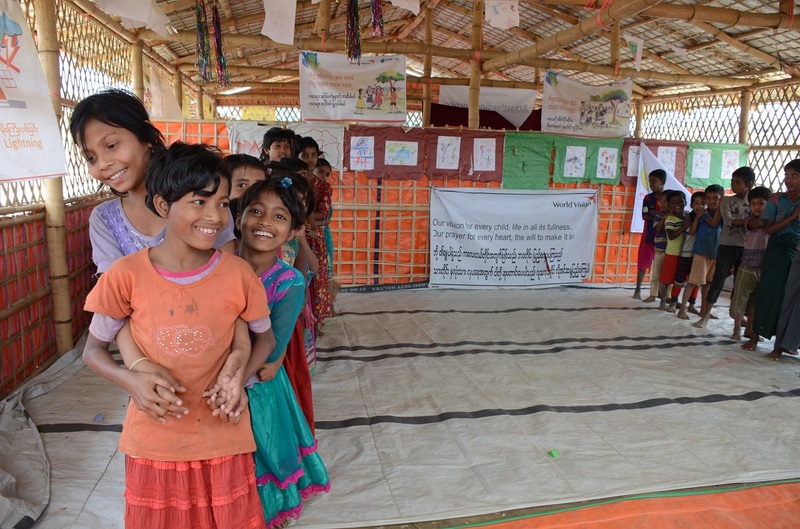 Photo: Rokiya, 9, and these other children receive informal education at a World Vision child-friendly space near her tent in Bangladesh. ©2018 World Vision, Himaloy Joseph Mree.